According to Dr. Brian Goldman, author of The Power of Kindness: Why Empathy is Essential in Everyday Life (HarperCollins Publishers, 2018), we all have the innate ability to be kind, gentle and to give of ourselves without the need to get anything in return. 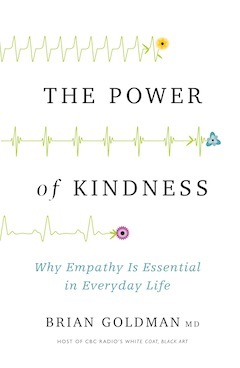 Goldman, who works as an emergency physician at Mount Sinai Hospital in Toronto, said the idea for The Power of Kindness had been germinating in his mind for a long time. In recognizing this in himself, Goldman decided to travel the world to speak to some of the kindest people to hopefully internalize their kindness and find ways to pass their enlightenment onto others. In doing this, he said, “I found answers and, for the rest, you’re going to have to read the book. But, I will tell you one thing. I found that some people are born with empathy. “I found one extraordinary child,” he said, by way of example, “who was nicknamed ‘Ta Ta.’ And he, at the time that I met him, was [almost] 3 years old. His mom, Shala, adopted a man on the streets of Sao Paulo who had been homeless for nearly 40 years and called him her soulmate. The striking thing about her situation is that her son, as a toddler … without ever having known what his mom had done, adopted his own homeless man. You can’t make that up. Goldman met people for whom empathy comes naturally and some who are gifted in empathy, but he also realized that we all share the same common experiences – adversity, disappointment, shock, loneliness, physical ailments and failure. “I think, more often than not, it’s these experiences that are the engine for empathy,” said Goldman. “Because, after that, you can either die or you can pay it forward. And the way you pay it forward is to provide comfort and empathy for people who are going through what you went through. That was probably the common denominator that I saw again and again. “Shame-based people tend to absorb the idea that they cannot make a mistake. If they do, it will be the end of everything. “My intuitive guess is that a lot of health professionals feel that way and that’s why they go into the health professions … because they are hoping that, if they can do enough good works, it will make up for the one mistake they made. According to Goldman, kindness and empathy are the ability to imagine what it is like to be somebody else, to see things through their eyes and act accordingly, to put yourself in their place. “Unless you have a narcissistic personality disorder, in which your brain circuits will show you’re less capable of empathy, you’re capable of empathy,” said Goldman. “Everyone is hardwired for empathy. But, the thing is that, at the highest levels of executive function, empathy is a choice and we are constantly being distracted by competing priorities – my needs versus yours, my family versus your family. I’m running around like a pinball … boy, that’s a dated metaphor … but I can’t be all things to all people all the time. It’s impossible. Somebody is going to judge what I’ve delivered as unkind care. Goldman suggests learning which factors get in your way and to start creating ways that work for you to push those distractions aside. In The Power of Kindness, he talks about breathing exercises – about how we get distracted by unpleasant thoughts and feelings and how to re-centre ourselves and allow the negativity to float away. “I use the metaphor of a parade,” he said. “There are beautiful floats and they represent nice thoughts – happy things that have happened or that I’m looking forward to – and you let them float by without judging them. Then, every once in awhile, there is a lousy float that’s ugly – the boss who is yelling at you, the coworker or somebody who you think is whispering about you behind your back, or the person who gave you the finger in traffic when you were both driving. As for what sort of reception the book has garnered so far, Goldman said it has been very positive.